Highline Residences: 80% of the 160 units released sold! Keppel Land, which started closed-door sales of its Highline Residences condominium over the weekend, said it has received a good response to the project. More than 80% of the 160 units - or over a quarter of 500 units available in total - released were sold at an average price of $1,900psf after discount. Discounts ranging from $28,000 to $68,000 were offered during the preview weekend. The price was in line with earlier expectations by market watchers of between $1,800 and $1,900psf. The positive response may be attributed to the pent-up demand for private housing in Tiong Bahru, which has not seen a launch in the past seven years. Sales at the condominium is widely watched given its prime location diagonally opposite Tiong Bahru MRT Station and Tiong Bahru Plazamall. Highline Residences' 500 units are housed in two 36-storey towers, a 22-tower tower and four low-rise blocks. Its unit sizes range from 506sqft for one-bedders to 1,227sqft for four-bedroom dual key units. It will also have six penthouses, ranging from 2,174sqft to 2,260sqft in size. The design of the condominium is inspired by New York City's High Line, a public park built on a historic elevated rail line. Residents may tap concierge services such as limousines and housekeeping, in addition to enjoying complimentary golfing at Keppel Land's Ria Bintang Golf Club. Okay, so the wife and I were wrong on the "hard sell at $1,900psf" bit. Kudos to Highline Residences and Keppel Land. And it just goes to show how much liquidity is still out there in the market. 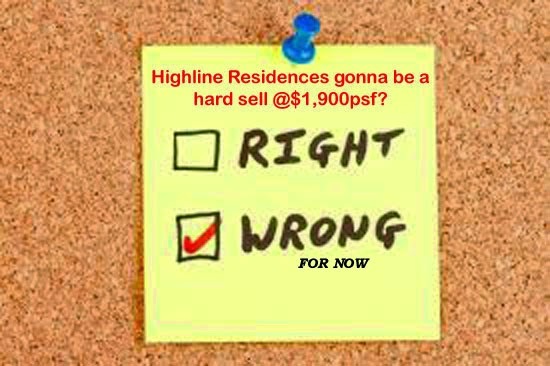 No Comment to " Highline Residences: 80% of the 160 units released sold! "